Successfully Added SATA Multimedia Player and HDD Enclosure (Up to 1080I) to your Shopping Cart. SATA Multimedia Player and HDD Enclosure (Up to 1080I). This multimedia player for 3.5 inch SATA hard disk drives (HDD) supports resolutions up to 1080I and lets you watch your multimedia files on the screen of your choice. Are you still watching movies on your old computer monitor, while your big screen high-def TV sits idle? Are those weeks of downloading the latest blockbuster movies eating up all of your computer's memory? Are you about to erase Star Wars just so you can download the new Star Trek? Don't push that Delete button! 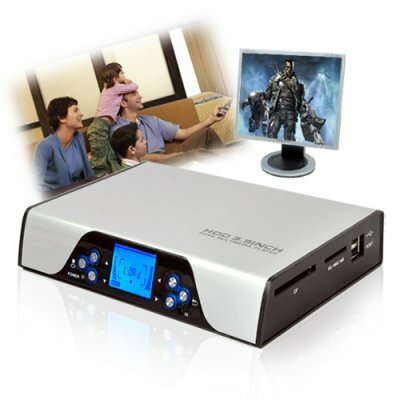 This multimedia player lets you enjoy all your favorite videos, movies, music and family photos on your TV, LCD monitor, high-definition screen, or home-theater projector. Now you can share photos with your family in the living room and invite your friends over to watch the latest movies on your big screen TV. A lightweight design lets you take your HDD player with you when you're traveling or just going to a friend's house for a few hours. Using this multimedia player is easier than wearing flip flops. Just pop your hard drive into the player, connect it to your computer with USB, and copy all your favorite media files. No matter whether you want to watch on a high-definition television, an LCD monitor, or a regular TV, this media player supports them all! With ports for USB and SD/MMC/MS/CF memory cards, loading new media is quick and easy. With powerful functionality, a user-friendly interface and an attractive design, this high- defmultimedia player is perfect for anyone with a large collection of media files. Chinavasion's factory-direct prices and discounts on bulk orders make this item a guaranteed money maker for online resellers and shop owners. At this price, they are sure to go fast, so get yours today! Do I have to format a hard drive before I can use it in this device? Your hard drive must be in FAT32 or NTFS format to use with this device. Will this work with my large 1TB hard drive? How do I load my media files onto this high-def multimedia player? Just connect it to a computer with the included USB cable. You can drag and drop your files onto the hard drive. How do I connect this device to a monitor or a TV? To connect to a monitor, use either the RCA, VGA, Scart, or HDMI cables, depending on the monitor or TV you are connecting to. How do I navigate through my files? The remote control and the simple menus make navigation easy. On your remote control, press "Movie" to watch your movies. Press "Music" to listen to your music. And press "Photo" to view your photos. You can also press "File" to browse through all your files. Does the device support the Greek language and does it display Cyrillic characters? The device does not support the Greek language and it does not display Cyrillic characters. on 2010-03-30 15:53:54 It is wonderful. When I decided to change my old TV I will have it in mind to buy one because I think after I read the specifications of the product this is the best solution for me to watch all of my videos and photos. This device works great! It has lots of functions, extra usb and SD slots, and is quite simple to use. The quality of videos is also very good. I use it with over 350 movies and many tv shows and navigating it page by page is very easy when selecting a movie. Quiet built in fan and front LCD. I use only mac and linux, i add HD and format to FAT32 in few minutes, work fine, very simple to use and good interface.